Millions of people around the world have vitiligo, according to the AAD, and the chances of having it increase for people who have an autoimmune disease and those who have a close blood relative with vitiligo. Most people who will get the condition develop it before age 21 and have it for the rest of their lives, as it is rare for vitiligo to disappear. Vitiligo is a condition that causes loss of pigment, so skin loses its natural color and light patches appear. People with vitiligo can have a few spots or many patches all over their bodies. They may also have a section of their hair turn white, or lose color in their mouths and eyes. Vitiligo is not contagious, nor is it life-threatening, but its cause is unknown. However, it can change lives because people with vitiligo are more likely to develop low self-esteem and even serious depression, according to the American Academy of Dermatology. Numerous celebrities with vitiligo have helped destigmatize it, particularly international model Winnie Harlow, who proves people with vitiligo can have successful careers in the public eye and be proud of their unique beauty. It equally affects all skin colors, races and sexes. Vitiligo becomes apparent when melanocyte cells, which give color to skin and hair, die. 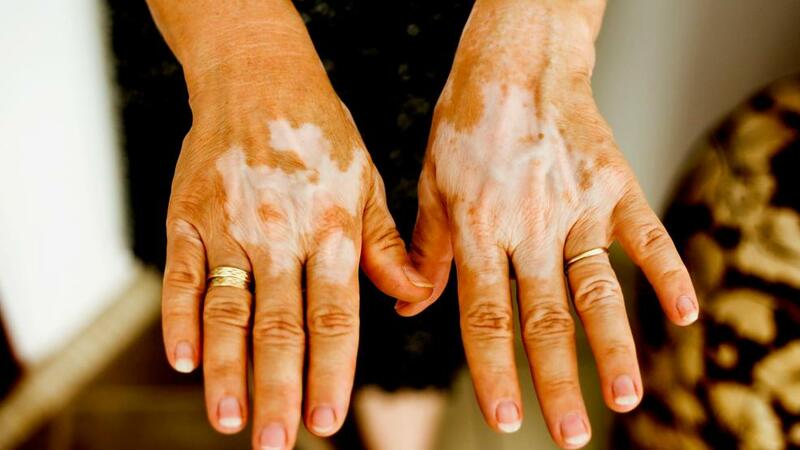 One type of vitiligo may be an autoimmune disease. Another type develops when something in the nervous system goes awry. Either way, scientists are researching the condition to better understand it, and more work needs to be done. The best treatment for vitiligo may be no treatment, the AAD points out. People with the condition can avoid tanning and wear sunscreen on any exposed skin when outside, as the areas of skin without pigment have no natural sun protection. Those who want to cover vitiligo can use makeup or self-tanners, as well as stains that dye the skin and wear off over time. Some may even choose micropigmentation tattoos. Repigmentation therapy — Topical corticosteroids return pigment to small areas and can be used in conjunction with other treatments. PUVA — This chemical makes the skin light-sensitive, so it can be treated with ultraviolet light A. Some areas of the body respond well while others, like hands and feet, do not. The treatments must be done twice a week for at least a year. Narrow-band UVB — This is a form of phototherapy that must be done two to three times per week for several months. It may be useful for children. Grafting — Transferring skin from another part of the body works for only a small group of patients and does not generally result in total return of pigmentation. Immunomodulators — This is a topical class of drugs that can help induce melanin production on certain parts of the body. Depigmentation therapy — A chemical permanently removes pigment from normal skin in a process that takes about a year. The whole body will then be an even white color. To discuss your situation and see what treatment options are right for you or your child, contact a dermatologist like one of the experts at Henghold Skin Health and Surgery Group. They can help you determine the best course of action to address your needs.